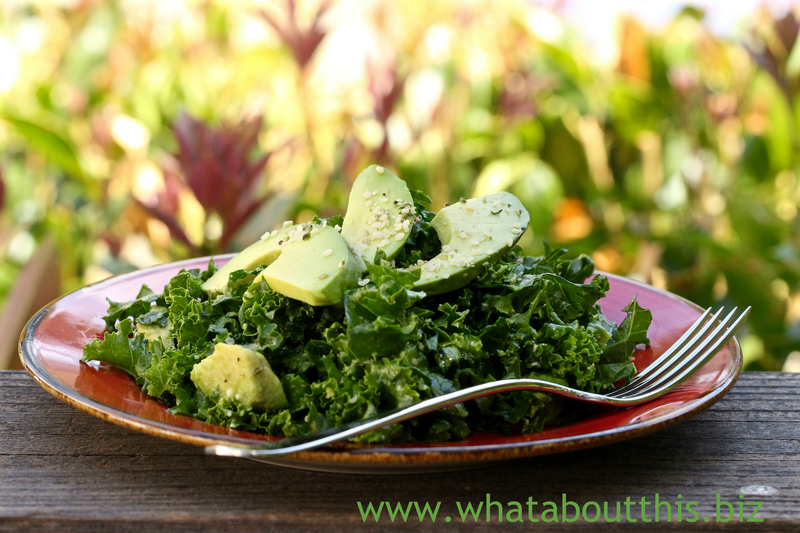 kale salad | What about this? Wait! You should think twice before you say, “Ewww . . . kale!” and snub this recipe. Try to withhold judgement until after you taste this easy-to-make and nutrient-packed salad. The earthy flavor and color of dark green kale leaves are wonderfully offset by the tropical fruit flavor and bright color of mango. And what makes this salad different from other kale salads is the massaged kale. Yes, that’s right, MASSAGED. Most of us know that a little oil and a gentle massage go a long way to relax tense muscles. Kale undergoes a similar transformation after a short and gentle massage. The tough and fibrous strips of kale become relaxed and tender. What’s not to like about eight simple ingredients that when combined together create a beautiful salad and a healthier you? 1. In large serving bowl, add the kale, half of lemon juice, a drizzle of oil and a little kosher salt. Massage until kale starts to soften and wilt, 2 to 3 minutes. Set aside while you make the dressing. 2. In a small bowl, whisk remaining lemon juice with the honey and lots of freshly ground black pepper. Stream in the 1/4 cup of oil while whisking until a dressing forms, and you like how it tastes. 3. 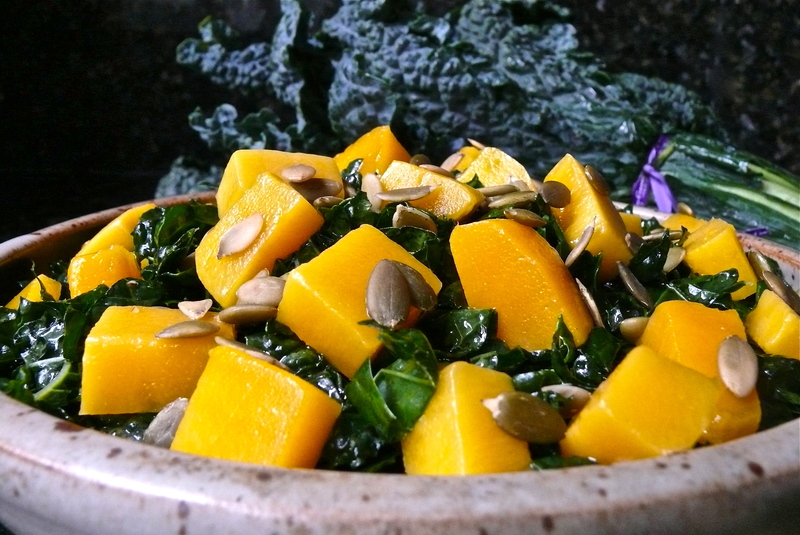 Pour the dressing over the kale and add the mango and pepitas. Toss and serve. 1. The easiest way to remove stalks from kale leaves is to hold the stem end in one hand and, in one motion, pull the leaf away and down the stem with the other hand. Repeat until all stems are removed. Wash and dry leaves. 2. To cut the leaves, stack several leaves and then roll them into a cigar. Slice your kale “cigar” crosswise to form thin ribbons. 3. The lemon I used was large, so I added a little bit more honey to take away some of the tartness in the salad dressing. 4. Other fruit, such as peaches or strawberries, could easily be substituted for the mango.